In the first half of 2010, GMA Pinoy TV has reportedly reached at least 256,000 subscribers while GMA Life TV has 122,000 subscribers. GMA Network went international when it launched GMA Pinoy TV in 2005, and GMA Life TV in 2008. Both channels air news and entertainment programs that aim to reach Filipinos across the globe. In the first half of 2010, which happens to be their mother network’s 60th year, GMA Pinoy TV has reached 256,000 subscribers, while GMA Life TV, some 122,000 subscribers. This is based on a report furnished to PEP by the corporate communications department of the Kapuso Network. "Our programs on GMA Pinoy TV and GMA Life TV are fruits of the labor of the best minds in the industry—from news and public affairs to entertainment. More than the impeccable production value of these certified top-rating shows, they carry the trademark Kapuso signature principle of ’touching hearts and enriching lives,’" says Joseph T. Francia, GMA’s Vice President for International Operations. Francia said that GMA Pinoy TV and GMA Life TV aim to banner the spirit of service in the two international channels’ operations. "Serbisyong Totoo means touching hearts and enriching lives. Aside from our world-class programming that brings the Philippines into the homes of our kababayans abroad, we also organized celebrations and initiated projects that best define how our two international channels carry out our mother network’s mission." Comparing themselves to Pinoy sports champions Ana "The Hurricane" Julaton and the RP Gilas team, GMA Pinoy TV and GMA Life TV are fighting to become formidable media entities overseas. In April, the RP Gilas five proved they were a team to be reckoned with when they waved the Philippine flag at the American Basketball Association. In June, the team dominated the Manila Invitational Basketball Tournament, and landed fourth place at the 32nd William Jones Cup in Taiwan in July. Aside from these achievements in sports, GMA Pinoy TV and GMA Life TV staged a series of concerts in the U.S. and Canada: Heart 2 Heart that featured Regine Velasquez, Ogie Alcasid, Marian Rivera and Dingdong Dantes. GMA-7’s top love team, Marian and Dingdong, made viewers fall in love again in their movie, You To Me Are Everything, with its series of international screenings last June. Eat Bulaga, considered an institution in Philippine entertainment, invaded the Sin City in June, and brought with it its trademark isanlibo’t isang tuwa to Pinoys in the U.S. Later that month, GMA Pinoy TV added flavor to the 20th Grand Parade and Festival of Jersey City in New Jersey with performances from Rhian Ramos, Mark Herras, and Kris Bernal. The Kababayan Fest on July 10 at California’s Great America Theme Park in San Francisco featured Kapuso primetime star Rhian Ramos, StarStruck V Ultimate Male Survivor Steven Silva, and R&B prince Jay-R. 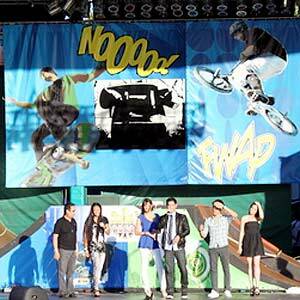 The July 17 Kababayan Fest party at the Knott’s Berry Farm in Los Angeles was bannered by Geoff Eigenmann and Carla Abellana, StarStruck ultimate survivors Kris Bernal, Jackie Rice, and Steven Silva. Plus, both celebrations had Pinay boxing champ Ana "The Hurricane" Julaton. While in Canada, Katrina Halili, Mark Herras, Wendell Ramos, John Nite, and German "Kuya Germs" Moreno entertained our kababayans at the Mabuhay Philippines! Toronto Summer Festival in July. "Yes, GMA Pinoy TV and GMA Life TV are very young channels—and we are indeed consciously gearing our efforts to innovate and make our services better for our Kapusos abroad," Francia said.